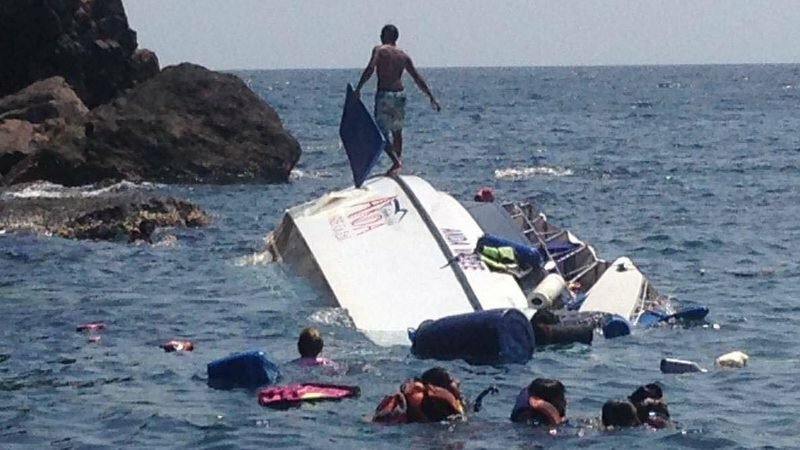 PHUKET: All tourists on board a Phuket speedboat that took on water and capsized en route to Phi Phi Island after departing Chalong Pier yesterday morning were safely recovered from the water yesterday afternoon (Jan 25). The Phuket Marine Office was informed by staff at Chalong Pier at about 11:40am that the tour speedboat Aphitada 1 was taking on water and had called for assistance, reports Thai-language newspaper Matichon. The boat was en route from Maithon Island to Phi Phi Island when it began taking on water. The captain pulled the boat close to Koh Dok Mai, about 13 kilometres direct east of the tip of Cape Panwa. Another boat passing through the area soon arrived and safely recovered all 43 tourists and the two crew. The tourists were put on board another boat to continue their journey to Phi Phi Island, said the report. The company that operates the Aphitada 1 is located in Wichit, Phuket, added the Matichon report, but failed to identify which company. Conditions on the bay yesterday were mild, with light breezes and some strong gusts, but waves not reaching more than one metre in height. What caused the leaky tour speedboat to take on water is now being investigated, the report added. Attempts by The Phuket News to contact the relevant officials for more details have yet to be successful. These plywood, disposable boats have never been seaworthy much less safe. Thailand boat builders must be made to produce boats to an international standard especially when used in the tourist trade. How many times have you read about a long-tail  boat tragedy? Not often. The name of the company was Andavaree. We booked through big tour Phuket. We was promised full refund and since we left only had 50% refunded as they said we did visit 2 islands and have lunch... Very poor please avoid if your thinking of booking with these. All the do's an don't about their equipment etc. but no safety briefing what so ever. I was on this boat that sank an it was hitting waves pritty hard going out to the  first & second island and the boat was doing some right creaking noises,  we joked at the first island as we saw the steering wheel with tie wraps holding it on. The boat had 5 crew on board NOT 2 and 38 tourists it was very cramped on board. They blamed it on hitting some debris floating in the sea..
A Speed boat, with 43 passengers + 2 crew= 45 persons. Is that allowed? Is Phuket Maritime Office on Chalong Pier not checking boat loads in morning departure time? Of course, no 'relevant' Officials available, they all duck in. Considering themselve this moment not 'relevant' just before the weekend. And next monday, all is forgotten as no lives lost. Quiet please, next disaster.